Hey Kids, want to go on a trip? How about a psychedelic murderous rampage against some gangsters with a variety of weapons while wearing a pig mask? Hope you're not shy about stomping guy's heads into a wall and slitting peoples throats! 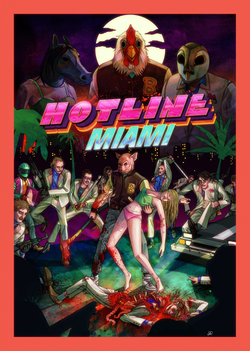 Welcome to Hotline Miami! Dungeon Keeper launched in the United States on June 26th, 1997. I don't know how, at ten years old, I came across this garish, vile, and extremely fun game, but I did and I thoroughly enjoyed it. Its unique game play has left me craving games like it. Sixteen years later and I still like to boot the game up once and a while just for old times sake. Dungeon Keeper was well received when it was launched back in the 90's but through the years I've often brought it up in conversation and no one seems to remember it. What about the game made Dungeon Keeper continuously stick out in my mind? Why did I love it so much? Amazon game studios was introduced and launched their first game “Living Classics” for Facebook back in August of 2012. In November Amazon followed up with their first Mobile App, Air Patriots. I've been playing through the different maps and seeing what the game brings to the table. Amazon is already a part of my every day life. Can they break through into the game development world and become even a greater part of that life? The re-release of XCOM: Enemy Unknown on Steam was my first experience with an XCOM game and I was pleasantly surprised with what I found. A deep turn based strategy game with some aspects of city simulation thrown in with a decent story that really keeps you hooked. Let's take a look at why this game is in my opinion a must own, not only a fans of the XCOM series, but for fans of strategy games in general.